That cold snap we had last week really messed with my internal calendar. Even though the wall calendar still said September, my body was thinking November and that set off all kinds of cravings for hot comfort food. I had curry on the brain because along with soup, it’s one of the first things I think of when cold weather sets in. 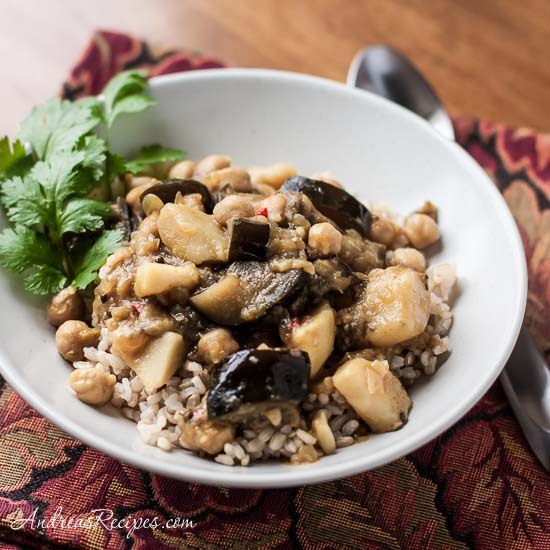 The eggplant that I had bought to make stuffed eggplant was repurposed and instead found its way into a soothing pot of steaming curry with potatoes and chickpeas. This is a low calorie and easy budget meal, and if you have some leftover boiled potatoes or cooked chickpeas or other vegetables, they can go right into the pot to make it even easier. We picked some jalapeno chilis and cilantro from the garden, and though I seeded the chilis they were still wickedly spicy, but the pepper season is about over so we’re trying to use them up and then will freeze or pickle the rest. This is my contribution to Grow Your Own, a blogging event that celebrates the dishes we create from foods we’ve grown, raised, foraged, or hunted ourselves. Ann at Mom Gateway is our host for this round, so be sure to visit her blog for more information about submitting your post. We hope you’ll join us! If you are new to the event, you can read more about the rules for participating at the Grow Your Own page. And make sure you check out the fantastic roundup from September, hosted by Girlichef. 1. Steam the potatoes in their skins until fork tender, then drain and allow to cool. Peel once they are cool enough to touch, then cut into 2-inch/5-cm pieces. 2. Remove the stem end of the eggplant and quarter it lengthwise. Cut the stem end into 2-inch/5-cm pieces. Cut the four part of the bottom end in half again and cut into 2-inch/5-cm pieces. Soak the pieces in a medium bowl filled with cold water for about 30 minutes, then drain well. 3. Heat the oil in a large saucepan over medium heat. Add the coriander seeds and cook until they begin to release their fragrance, about 3 minutes. Add the onions, ginger, and peppers and cook, stirring occasionally, until the mixture begins to brown, about 7 minutes. 4. Add the curry powder and stir, cooking for 1 minute, then add the tomato paste and stir. Add the warm water, salt, and chickpeas, and eggplant, then bring to a boil. Reduce heat to medium and cook for 8 to 10 minutes, stirring occasionally. Add the potatoes and cook another 2 to 3 minutes. 5. Ladle into bowls with brown rice and garnish with cilantro leaves, or serve with pieces of Indian flatbread. Se ve deliciosa esta receta, me la apunto para la proxima vez que cocinaa berenjena. What a delicious healthy dish. This soup looks filling and not to difficult to make.